Epsilometer test (E- test ) is an ‘exponential gradient’ method of determination of antimicrobial resistance. The E-test has been developed to provide a direct quantification of antimicrobial susceptibility of microorganisms.This is a quantitative method that applies both the dilution of antibiotic and diffusion of antibiotic into the medium. The device consists of a predefined, continuous, and exponential gradient of antibiotic concentrations immobilized along a rectangular plastic test strip. After 48 hours incubation a drop-shaped inhibition zone intersects the graded test strip at the inhibitory concentration (IC) of the antibiotic. A predefined stable antimicrobial gradient is present on a thin inert non-porous plastic carrier strip 5mm wide, 60 mm long known as E-test strip. 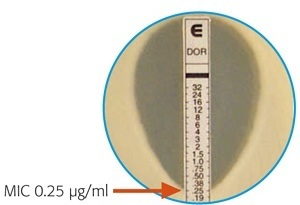 When this E test strip is applied onto an inoculated agar plate, there is an immediate release of the drug and establishment of an antimicrobial concentration gradient in an agar medium. After overnight incubation, the tests are read by viewing the strips from the top of the plate, a symmetrical inhibition ellipse is produced. The intersection of the lower part of the ellipse shaped growth inhibition area with the test strip indicates the MIC value. • Non-fastidious cultures plated out for single colonies. Remove the E-test package from the freezer (-20°C) at least 30 minutes before required. Emulsify 3 or 4 individual test strain colonies and transfer to a tube of saline. Compare turbidity to that in the 0.5 McFarland standards. Adjust turbidity of inoculum to match that standard. Dip a sterile cotton swab into the inoculums and pulling out slightly, rotate the swab several times against the inside of the tube above the fluid level to remove excess liquid. Streak the swab over the entire surface of the agar plate by rotating the plate approximately 60o. Complete inoculation by running the swab around the rim of the agar. Leave the lid of the plate ajar for 5 minutes (no more than 15 minutes) to allow any excess moisture to be absorbed before applying strips. Open E-test package by cutting package along the broken line. Apply strips to agar surface using forceps (or E-test applicator if available). Place the strip with the ‘E end’ at the edge of the plate and with the scale visible (i.e. facing upwards). If strips stick together, they may be pulled apart by handling the section marked E. Do not touch any other area of the strip. Use templates to position 4 to 6 strips onto a 150 mm plate or one (seldom two) strips onto a 90 mm plate. Do not remove or replace a strip once it has touched the agar. Incubate Plates at 37°C for 18-24 hrs. Read MIC at the point where ellipse intersects the scale. If a MIC value between two twofold dilutions is seen, always round up to the highest value. Read the MIC value at complete inhibition of all growth. If the intersect differs on either side of the strip, read the MIC as the greater value. Ignore any growth at the edge of the strip. MIC values of the bacteria should be interpreted as S (Susceptible), I (Intermediate) or R (Resistant) by comparing the breakpoint values of each antibiotic with the criteria recommended by CLSI. can these strips be used for any kind of bacteria…or there are some specificities????? could i use them for Lactobacillus ???? if yes…..how and which media i can use???? I worked in a clinical microbiology lab for a number of years. I initially did some MIC tests but gradually the lab ceased performing the test. Anyway, since I’m in a rush, I could not complete the reading, although I’m really keen to return to your blog, later. However, I wish you could share with me some disk diffusion techniques on ESBL.